If you don’t know what Love Letter is, see my short description in my previous post. If you like the game and are in a creative mood, you can try making a judge themed version of the game. And if you do create a print & play version, send it to me and I’ll put it up on the blog. 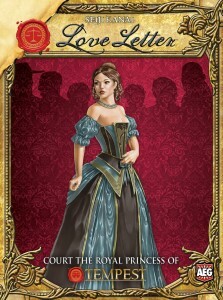 In this version of Love Letter, you are trying to get the last result slip in to the Scorekeeper at the end of the round. As with the normal game, the player with the highest ranked card or the last player holding on to a card wins and gets a point. However, instead of playing to a certain number of points, you always play nine rounds (like Day 1 at a Grand Prix). the player (judge) with the most points wins. In case of a tie, the tied player who won a round most recently is the winner. (As the day wears on, more focus is on finishing the rounds faster). Here are the cards you use to play this variant. The actual rules have not changed, so I’m providing the rank, new name, original name, and thematic background. 1: Player (Guard) – The player is unlikely to bring the slip up quickly, so it’s better to keep it in the hands of a judge. Also, if a player corners a judge, they might forget to bring the slip in. 3: Team Leader (Baron) – Team Leads sometimes get competitive. Whichever team is closer to getting the slip in wins the comparison. 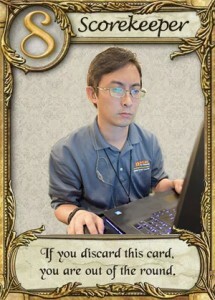 4: Regional Coordinator (Handmaid) – Hey, I need to clarify some stuff with my RC, so I’m unavailable for the next turn. 5: Appeal Judge (Prince) – When the HJ is unavailable, AJ makes sure the tournament is running smoothly. 6: Head Judge (King) – It’s good to be the King. 7: XO (Countess) – The XO will try to block any interruptions to the AJ / HJ, triaging incoming things. 8: Scorekeeper (Princess) – The goal is for the result slip to land with the SK. If you lose him, the tournament suddenly has a big problem.